India’s aviation market may have witnessed double-digit growth for nearly four years, but the number of chartered and private aircraft (termed General Aircraft) as well the number of non-scheduled flights have dropped, an indication of how expensive it is becoming to maintain and operate private planes. According to the Directorate General of Civil Aviation (DGCA), the number of operators with the so-called Non-Scheduled Operator’s Permit (NSOP) reached a peak of 147 in 2011-12 and then fell. It was 111 in 2017-18. The NSOP fleet in India comprises 356 aircraft, including helicopters. This is down from a peak of 412 aircraft, again in 2011-12. General Aircraft (GA) movements have also remained nearly static over the last nine years, below the 300,000 movements per annum mark, and in 2017-18, actually saw a 6% drop over the previous year.. According to civil aviation ministry officials, high taxes on jet fuel, steep airport charges, and shortage of hangars and parking slots are behind this. The civil aviation ministry has proposed separate airfields for GA in the country’s 10 largest cities and also a separate terminal with customs and immigration facilities for charters. “It is good that the ministry of civil aviation has recognised that general aviation is necessary. That’s how you are able to develop your own manpower. People gain lot of flying experience through general aviation. But for general aviation to grow, some fundamental changes are required, which we have taken up with the government. The problem of congestion will be sorted in 3-4 years with a second airport and more runways in Delhi and Mumbai,” said Rajesh Bali, Managing Director of the Business Aircraft Operators Association (BAOA). The ministry of civil aviation, in a report released at the Global Aviation Summit on January 15, admitted that the biggest challenge faced by the GA industry is the infrastructure deficit especially at major airports such as at Delhi and Mumbai. “This is where a majority of owners and clients of GA live and work. Since preference is given to scheduled airlines in the morning and evening peak hours, the curfew hours imposed on GA renders them ineffective. The planning and road-map for aviation infrastructure so far has not taken note of GA requirements. The high taxes imposed on GA are primarily due to its branding as a ‘luxury’ item. This is very similar to how commercial aviation was looked at, less than two decades back. The current users of GA are the primarily the rich and powerful - politicians, industrialists, corporate executives and celebrities. Given its elitist tag, any support to GA is perhaps considered politically risky. It therefore continues to remain a high cost luxury; out of reach for most middle class Indians. The elitist tag remains a self-fulfilling fallacy,” the ministry said in the report. According to Bali, because slots are difficult to get, some GA customers end up flying commercial. 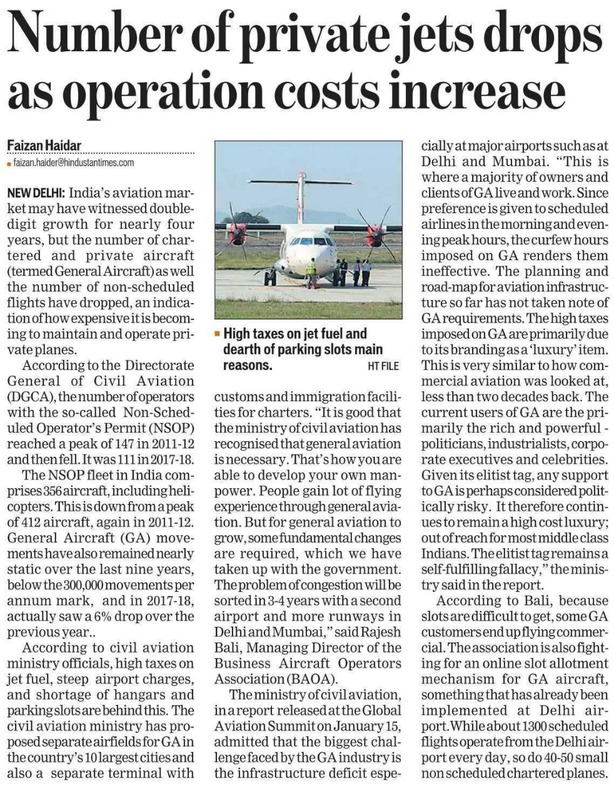 The association is also fighting for an online slot allotment mechanism for GA aircraft, something that has already been implemented at Delhi airport.While about 1300 scheduled flights operate from the Delhi airport every day, so do 40-50 small non scheduled chartered planes.